I’ve trained in martial arts since I was in primary school. In 2006, I’d been away from any form of training for 6 years and started looking around for local clubs. Amazingly I found the Bujinkan Sevenoaks Dojo on the Internet – it was 2 minutes from my house and had just opened – what a coincidence – I had to check it out! Initially training was similar to some of the other Ju-Jitsu schools that I’d studied, but soon I began to see the differences. Although we have structured training methods, we are actively encouraged to think for ourselves, experiment and make the movement and techniques work for ourselves. This is a martial art that you eventually have the freedom to move naturally. I travel a lot with work and have been fortunte enough to have made good friends training in the Bujinkan all over the world. That is a real bonus – you can train in any other Bujinkan Dojo without having to start from scratch. Since I’ve been training, I’ve visited Japan over a dozen times, learned to speak Japanese and am starting to get an understanding for how the subtle culture of Japan relates to their martial arts. I would never have had this opportunity had it not been for the Bujinkan. Every class, in every dojo, you learn something new. It’s truly a martial art that you will never outgrow nor get bored with. 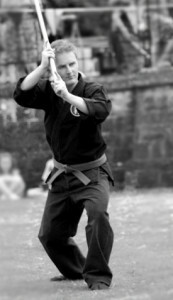 Steve also runs training at Bujinkan Kemsing. My martial training began in my early teens with the study of Chinese arts. I continued with these for around five years until I discovered Ju-Jitsu. Almost straight away I trained in this art solely, for a decade. My journey into the Japanese arts continued with Iaido and Aikido. Around 1999 for personal reasons I gave up training altogether. After a few years I began searching for a new martial challenge and began visiting various local dojos but nothing felt quite right for me. Then in 2006 I discovered the Bujinkan Sevenoaks dojo and it felt like I had come home. This martial art I find truly amazing and the instruction is second to none.It makes you think for yourself and allows you to develop in your own martial way. It has really opened my eyes to training and enabled me to rebuild myself. The Bujinkan feels like one happy worldwide family from which I have had the pleasure of meeting a lot of great people and forming long lasting friendships. 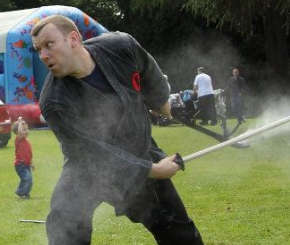 David also runs training at Bujinkan North Kent Dojo. I have always been heavily interested in Japanese culture and I was looking to get back into martial arts after a short absence. This was early 2010. I was looking for a martial art which encompassed everything about Japanese culture which I had come to love, mainly through the old samurai films of the 50s and 60s. The Bujinkan certainly has this feeling, with the martial schools within it being some of the oldest recorded schools. Personally something I really wanted to be incorporated in the art was weapons skills and I am certainly not disappointed. The weapon skills and body skills go hand in hand and you really learn something new each class; this may be a new technique, or discovering something deeper in a technique you thought you had understood. The way that you move and learn with your training partner is something I have not seen anywhere else. Feeling your way through a technique, understanding the body movement and then adapting it to your partners’ movement is a great feeling, and gives you a great cognitive workout as well as a physical one. The training from your teacher is also delivered in a way which would be unfamiliar to most. It is a very personal experience and although there is a whole class, most teaching comes down one to one. The Bujinkan has been a very positive experience for me and is one in which I hope others will join me in. I started training in martial arts when I was 17 years old. 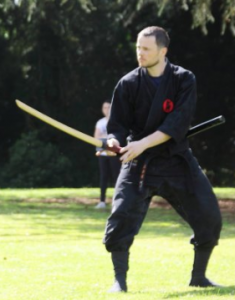 I attended a Wing Chun school for a couple of years but I never really felt fulfilled after the school closed down I toyed with a number of different martial arts until I found the Bujinkan Sevenoaks Dojo in 2012. The training was different to anything I had experienced before and the club made me feel very welcome. I settled in quickly. We train with a variety of different weapons and unarmed techniques there is something for every situation – it’s very interesting. I just wish I had discovered it many years ago.